Photos special to the Journal. For Over the Mountain students, summer break is the time for lake trips and summer camp. But many area teens add church-oriented service projects to that list. Internationally and locally, teens did everything from paint houses to host summer day camps for disadvantaged children. Once a successful commercial fishing town, Bayou La Batre was devastated by Hurricane Katrina in 2005 and then five years later by the Deepwater Horizon BP oil spill. Nearly three dozen middle and high school students from Valleydale Church in Hoover witnessed first-hand the economic depression and unmet basic needs of people affected by these disasters. “It was a chance to show them that even in Alabama, people are living in one-room houses trying to make it. They have the same concerns we do but, through no fault of their own, they can’t make ends meet,” said Josh Knierim, student pastor. The students spent time with local children putting on a kids’ camp and they helped with basic home repairs. Students and staff also did small things to make homes more energy efficient, thus helping reduce utility costs. Trinity United Methodist in Homewood sent students to Memphis to help repair homes. Nearly 160 students spent the week fixing homes to make them safer, warmer and drier. Knierim said the trip was eye-opening to the students because it showed them examples of extreme need but also immense hope. “These families have a lot of hope despite not having anything. They have faith and they encourage one another,” he said. Additionally, a small group of Valleydale Church high schoolers journeyed to Guatemala. Teens did a kids’ camp there as well. For some it was their second time to the country, and Knierim said it was moving to see that some of the children remembered small things from last year, such as special handshakes. “It shows that even short-term mission trips can have an impact,” he said. When it comes to student service and mission work, Executive Pastor of Family and Youth Ministries David Thompson said Trinity United Methodist in Homewood follows the guidelines laid out in Acts 1. “Jesus said, ‘You will be my witness in Jerusalem, and in Judea and Samaria and to the ends of the earth.’ We try to follow that example by serving in our community and to the ends of the earth,” he said. This summer, Trinity’s student ministry sent teens to Panama, Memphis and western Birmingham. A group of about 20 people went to Panama to do construction work at a camp. It is a trip the church has taken for many years and a chance for students to learn about cultural differences, construction and, most importantly, empathy and serving others. The church also sent students to Memphis to help repair homes. 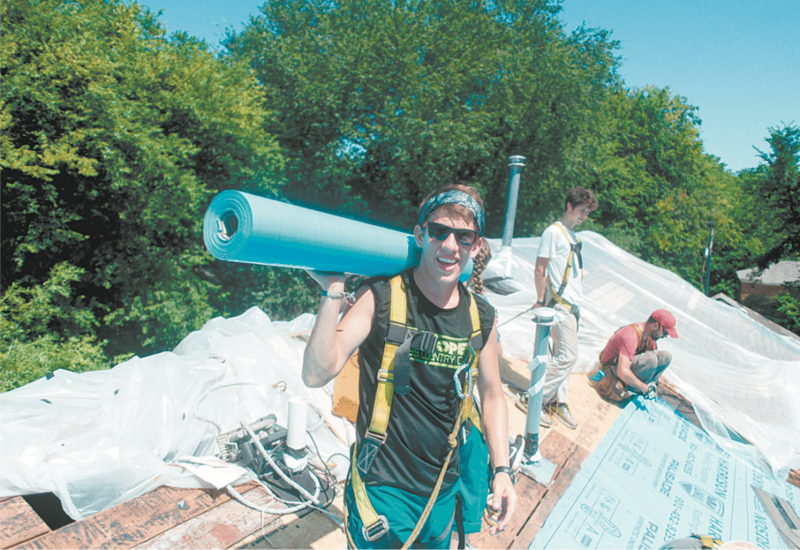 Nearly 160 students spent the week fixing homes to make them safer, warmer and drier. As for middle schoolers, Thompson said they spent time in western Birmingham painting houses. He said it may seem like a trivial job, but many of the homes hadn’t been painted in years, and a new coat of paint goes a long way to protect the home and encourage the homeowner. Thompson said each of the service opportunities yielded a new perspective for students and brought many closer to God. Trinity staff made an extra effort this year to try to pry students away from their phones and social media during the trips. “We didn’t allow any phones or any social media. It might be the only time in 52 weeks of the year that kids keep their heads up and interact more verbally. By the end of the week, many of the students commented that it was ‘awesome’ not to have their phones out constantly,” Thompson said. He said that, even though he knows students likely went straight back to old phone habits after the trip, he hopes the time they spent being present in the moment during a week of service sticks with them through the year. 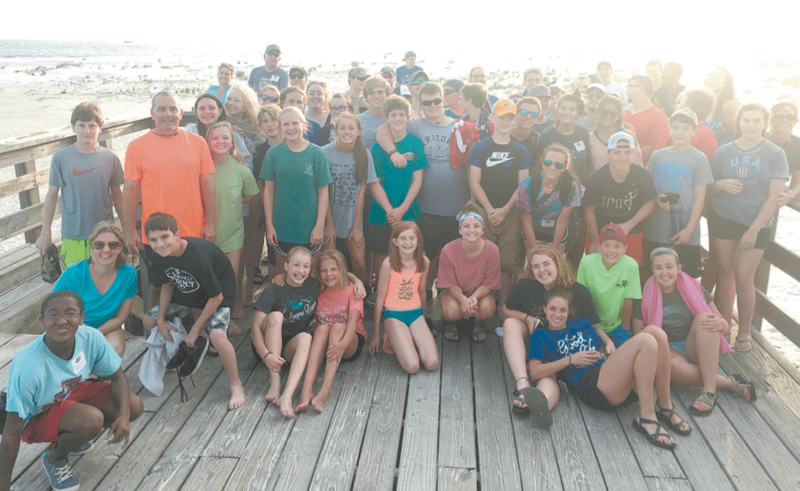 A group of middle and high school students from Valleydale Church traveled to Bayou La Batre to run a camp for kids and do basic home repairs. Mountain Brook Baptist Church students have focused their summer mission efforts on needs right here in Birmingham. In a partnership with Serving You, in Woodlawn, teens have gone outside their comfort zones and spent time in conversations with people in need. Serving You is a ministry that works with partner churches and Christian non-profit organizations to care for people who need assistance with food, utility bills, clothing and other needs. Students from the church spent an afternoon or morning with people who had gone to the Serving You facility for help. Mountain Brook Baptist Church’s minister to students, Hayden Walker, said this type of local mission work is especially impactful on both students and those in need. Walker said she has witnessed students overcome nervousness about interacting with people in need and even spontaneously pray with a family. She has seen leaders emerge and empathy grow among the students. Every other year, the church sends a group of high schoolers on a mission trip to South Africa. While this is an off year for the trip, Walker said the service opportunity at Serve You is just as eye-opening, if not more so. “It is easy to get into the mindset that that holy experience of missions has to happen somewhere else when three miles from your house is a similar ministry. It is almost the exact kind of work they would be doing if I had taken them to South Africa on a mission trip,” she said. As school resumes in August, Knierim, Thompson and Walker all said they are eager to see how students approach the school year in light of their summer experiences.